In my next post, I will be posting an interview with the author. How many left-leaning young women would have given up their quiet, comfortable pre-teen and teen years in North America to live as the daughter of a revolutionary? Imagine attending a middle school where you rub elbows with the children of rightwing political leaders, the very people your parents are working against. Or what about doing a little late afternoon grocery shopping only to come face to face with an armed secret service agent and having to run for your life. 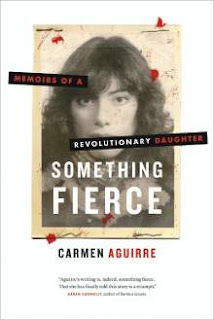 These are some of the personal experiences that Carmen Aguirre describes in Something Fierce: Memoirs of a Revolutionary Daughter. Aguirre’s parents were leftwing activists who were blacklisted after General Pinochet overthrew the democratically elected President Salvador Allende in 1973. The Aguirres were forced to flee their native Chile and live in exile in Vancouver. While Carmen’s father chose another life in Canada, her mother was determined to fight on. In 1979, when Carmen was 11, her mother took her and her younger sister back to South America to work in the resistance movement helping exiled dissidents return to Chile through its bordering countries. Her mother’s partner, Bob Everton, a Canadian internationalist who had been taken prisoner and tortured by the Pinochet regime in 1973, later joined them. Carmen’s mother and Everton begin their undercover work in Lima, Peru, and gradually make their way through the Peruvian highlands to La Paz, Bolivia, where the family sets up a safe house for resistance members. Although Carmen is aware of the activities that are going on in her home, nothing is explained to her or her sister in explicit terms. This is where Carmen’s double life begins. To her Bolivian classmates, Carmen is a Canadian pre-teen, while at home she lives by socialist values instilled by her underground revolutionary mother. La Paz is where the young Carmen comes of age, listening to pop music and stealing kisses from boys, but always with a watchful eye on the potentially explosive streets of dictatorship-run Bolivia. At the same time, the U.S.-backed Operation Condor had been set up by right-wing dictatorships in Chile, Argentina, Paraguay, Uruguay, Bolivia and Brazil employing secret service agents to eradicate socialist operatives such as Carmen’s mother and partner. The family later moves to post-Malvinas Argentina where Bob and her mother clear paths through the Andes into Chile. Their existence is more challenging both physically and financially until Carmen’s mother decides that it is too dangerous for her teenage daughters and forces them return to Canada. But at age 18 Carmen returns to South America with her Argentine boyfriend, where they earn their pilots licenses in Argentina to fly returnees and goods into Chile. Aguirre lives through some harrowing experiences, but fights on until the movement ends in 1989. What makes this book exceptional is that it features two generations of impassioned women revolutionaries, in addition to presenting several other courageous women resistance fighters. Although there have always been women involved in underground political movements, they are rarely given any ink. Nevertheless, what becomes apparent in Something Fierce is that the work is extremely demanding, both mentally and physically. Whether male or female, operatives have to be able to think on their feet, conceal and cope with unrelenting fear, terror and paranoia and, above all, be inconspicuous. It’s no small wonder that when Carmen Aguirre returned to Canada, she turned to her best-honed skill—acting. Today, she is an award-winning playwright having written and co-written 18 plays and has over 60 stage, film and TV acting credits. If you have an interest in Latin American politics, have repeatedly watched the footage of the 1973 Chilean coup or ever dreamt of being a leftist revolutionary, Something Fierce is a must-read. This is a thoughtful, moving first-hand account of revolutionary life without any of the hackneyed heroics or patriotism. Parts of this book will definitely play over in your mind well after you’ve turned the page. : Review: Something Fierce by Carmen AguirreTweet this! Amen. The women in this book made me completely rethink Marina Nemat's experiences in Prisoner of Tehran. Not that hers were any less grave, but the choices she made were to bend wirh the wind, rather than lean against it. I see Aguirre's actions as the braver path.